Cornwall is world-renowned for its many great gardens and this tour gives you an opportunity to discover three of its very best. We visit the Lost Gardens of Heligan, The Eden Project and Trebah Gardens as well as time to explore the historic city of Truro. We depart from your home pick-up; join your tour coach for your journey to Cornwall, stopping enroute for lunch, arriving at your hotel late afternoon, time to relax before dinner. Full day visit to the amazing Eden Project  a global garden where each environment is isolated in its own biome so large that it could house the Tower of London, stunning plants, exhibitions and stories serve as a backdrop to the striking contemporary gardens. Outside you will find exhibits, unique sculptures and a vibrant global garden that tells the fascinating story of plants and how we use them for medicine, fuels, materials and food  its quite a place! This morning we head for Heligan, seat of the Tremayne family for more than 400 years and regarded as one of the most mysterious and romantic estates in England. A genuine secret garden it was lost for decades, its history consigned to overgrowth. In 1991 the gardens were rediscovered from the brambles of time and a year later The Lost Gardens of Heligan opened to the public and it remains one of the most loved and romantic gardens in the UK. In the afternoon we visit the historic city of Truro, the city is best known for its magnificent Neo-Gothic cathedral with its soaring spires and eye-catching elegant beauty. This morning we visit Falmouth, a town renowned for its maritime heritage  perhaps visit the award winning National Maritime Museum Cornwall which houses a huge collection of boats and retells stories of intrepid explores. 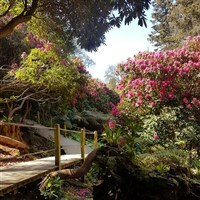 This afternoon we visit Trebah Gardens, a Cornish Valley Garden rich with exotic blooms, vibrant tunnels of colour and its own private beach. Please note: if clients have walking difficulties some areas of Trebah Gardens may be inaccessible. Sadly this morning after breakfast we begin our homeward journey with refreshment stops enroute. · Admission Eden Project, Lost Gardens of Heligan and Trebah Gardens. Situated at the world famous Fistral Beach the hotel benefits from astounding Atlantic Ocean views which are enjoyed from the restaurant & lounge. Rooms are equipped with tea/coffee making facilities, TV, complimentary toiletries. The hotel also has an indoor pool, jacuzzi, sauna, restaurant and bar. Starting with your home pick-up, join your tour coach for your journey to Cornwall, stopping enroute for lunch, arriving at your hotel late afternoon, time to relax before dinner. Full day visit to the amazing 'Eden Project' - a global garden where each environment is isolated in its own 'biome' so large that it could house the Tower of London, stunning plants, exhibitions and stories serve as a backdrop to the striking contemporary gardens. Outside you will find exhibits, unique sculptures and a vibrant global garden that tells the fascinating story of plants and how we use them for medicine, fuels, materials and food - its quite a place! This morning we head for Heligan, seat of the Tremayne family for more than 400 years and regarded as one of the most mysterious and romantic estates in England. A genuine secret garden it was lost for decades, its history consigned to overgrowth. In 1991 the gardens were rediscovered from the brambles of time and a year later 'The Lost Gardens of Heligan' opened to the public and it remains one of the most loved and romantic gardens in the UK. In the afternoon we visit the historic city of Truro, the city is best known for its magnificent Neo-Gothic cathedral with its soaring spires and eye-catching elegant beauty.